Today’s picture is from an elementary school. After you walk in through the main doors, you immediately encounter this stairwell. It is literally twenty feet at the most from the entrance. The first thing that catches your eye is that the doors are wide open. Of course this is a fire hazard and could be corrected by closing them or installing magnets that release when the alarm is sounded. Let’s put that aside for a moment. I want to focus on the ‘other’ things that are happening here. Categories: General Posts, What Do You See Wednesday | Tags: CPTED, Don Shomette, Reshaping the enviornment, safety expert, School based crime prevention, School Resource Officer, school safety, school security, SRO, SRO Toolbox, The Shomette Group, What do you see wednesday? | Permalink. Today’s picture is from a recent trip to Missouri. After completing training, I went to grab some dinner but I just couldn’t help myself. I had to stop first and take a quick picture (crime prevention can be such a happy curse!). While this is not a public school, it has every strategy at play that we would use in a school to prevent violence. Good luck! Categories: What Do You See Wednesday | Tags: CPTED, Don Shomette, preventing a school attack, Reshaping the enviornment, safety expert, School based crime prevention, School Leadership, School Resource Officer, school safety, SRO, SRO Toolbox, The Shomette Group, What do you see wednesday? | Permalink. Let’s review and discuss the last, “What Do You See Wednesday from 12 Feb 2014. Diana Back: Hm….the overhang and brick pillars could be hiding spots for “ambushes” and I also don’t like the fact that there are no windows to see in or out. Corporal Rob Sarnoski: There’s at least three things that could be improved. The inoperative lights are probably the most obvious issue. A note to mx should get that oversight fixed. Second, the wooden pallets partially obstruct the ramp. That will be important if there is an emergency in which people have to evacuate the building. Finally, the entry into the building is not clearly numbered for first responders. If the entry is not numbered on the outside, it’s probably not numbered on the inside either. Thanks, Diana and Rob for the comments. You’re observations are right on and I agree with you completely. I just have a couple of other points to add. 1. The lights are still on and it’s daytime. This concerns me. It could just be that the timer is turned off or it could be something bigger. Taking in everything that is happening in the picture (or not happening) I think it’s the latter. If I was doing a vulnerability assessment on this school I would initially be thinking that policies and procedures are not being obeyed by the staff or confirmed as being completed by the leadership. I would look for more clues (observable facts) so I could get an accurate and fair picture, but what I’m seeing worries me that we may have a leadership problem. I may be wrong, but this is why ownership is so important. Ownership or a lack of it sends a clear message that either the person cares or they don’t care. All things being relative, what message do you get from this picture? What message do you think this is sending to would be offenders? Is this an easy target or hard target? 2. The worn spot of grass near the door is more than just water runoff. Someone is using this space as a gathering spot and they’ve killed the grass. Most likely this is the custodial crews using it late night to smoke a cigarette and/or to take a break. Look for every indicator that gives you a better idea about the behavior of the people using the space. The worn grass isn’t a big thing but it helps us to get to know the people and that’s very important. The more we know, the better informed our recommendations will be and therefore the more we can help! 3. Pallets used as ladders. Pallets have been used in the past to gain access to the second story as well as the roof by creating a makeshift ladder. It only takes a second to put them in place and then you just run up it (if you’re brave or dumb enough). In a normal situation, it would be less of a concern but this is a high risk area with lots of unwanted behaviors in the past. The little things have to be managed and addressed immediately because they can turn into bigger things very quickly. 4. The overhang is new. You can tell because of the light in the upper right. No one would waste their time putting a light there if it was just going to be blocked by the overhang. The overhang must have been added later, after the light. I just want to remind everyone not to build on or to make any renovations until someone has checked the modifications to make sure that they will not make the space less safe. This overhang may have been needed but the design made it less safe. This could have been avoided. From a distance the window screens look like normal wire, but they are in fact a high security metal mesh. This is good exterior security but it will delay officers attempting to force entry since the only way to open these types of windows is with a special key or from the inside. You cannot cut your way into this. If I was still an SRO I would drive around to all of my buildings and ask myself—is there anything that would delay or prevent me or another officer from gaining access in less than one minute? If so, I’d carry the counter measures in my car and suggest that several be distributed among the road officers. I’d make sure to include a couple of bolt cutters (Cho locked doors at VA Tech with chains) and several battering rams (Roberts barricaded the windows at the Amish school). We’re down to minutes matter and we have to shave every second we can from our response. Categories: General Posts, What Do You See Wednesday | Tags: CPTED, Don Shomette, preventing a school attack, reducing violence in schools, School based crime prevention, School Leadership, School Resource Officer, school safety, SRO, SRO Toolbox, The Shomette Group, What do you see wednesday? | Permalink. 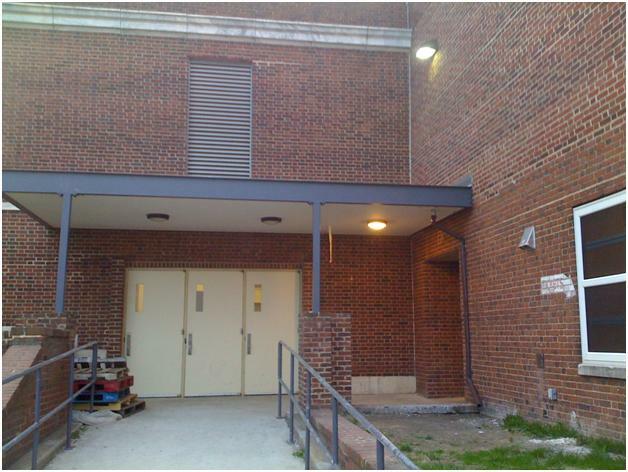 Today’s picture is from a middle school in an urban school district with severe safety concerns. Good luck! Categories: General Posts, What Do You See Wednesday | Tags: CPTED, Don Shomette, preventing a school attack, reducing violence in schools, safety expert, School based crime prevention, School Leadership, School Resource Officer, SRO, SRO Toolbox, Threat Assessment, What do you see wednesday? | Permalink. Let’s review and discuss the last, “What Do You See Wednesday from 5 Feb 2014. Corporal Rob Sarnoski: Classroom windows do not appear to have blinds or other covering in the event of a lockdown. There is also a crock pot plugged into the wall in an area that could easily be reached and/or disturbed by the students. Claire P: crock pot plugged in and sitting on top of the bookcase? Thanks Claire and Rob for the comments and great job spotting the crock pot. Sometimes we are so focused on stopping the ‘big’ stuff that we miss the lesser safety concerns that can still cause a lot of harm. At the time this picture was taken, one student is standing near the crock pot and one student is bending over beneath it to get a book. It wouldn’t take much for the crock pot to spill and someone to get hurt. I also want to bring up another point. This is more of a mindset, something to be encouraged and talked about during staff meetings and trainings. Any space that a teacher can see falls under the teacher’s area of protective responsibility. That means if a teacher can see the parking lot, main entrance, hallway, stairwell, bus loop, or any other area from their classroom they are responsible to help keep it under observation during the school day. That doesn’t mean they have to stare at it, but just every now and then glance towards it. If every teacher did this simple little thing it would greatly increase the safety filters and layers and make our schools much safer. Some might say that this is too much to ask of our teachers. It’s not. In fact, I guarantee that it will not impede the teacher in any way. How do I know? Because I do it when I present and in the last sixteen years it has never ever once impeded a presentation. In truth, I never even think about it anymore. I just do it because it has become a mindset and this is where we want our teachers to get to—a mindset of active access control. Now back to the picture. 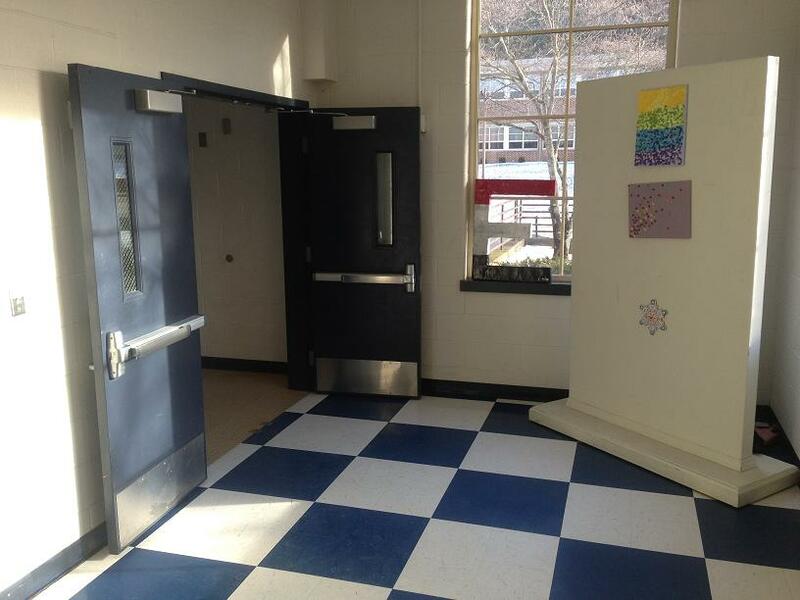 The teacher can see into the adjacent classroom as well as the picnic table which is located beside an exit/entrance. This is a good thing. If encouraged and trained in what to do, this teacher could be a great help in watching and reporting potential threats trying to gain entrance into the building. They could also help alert the administration if her fellow teacher across the way is ever in distress and needs immediate assistance—and vice a versa. For a little bit of extra work we will make our schools safer, encourage a team attitude, develop a proactive mindset to preventing violence, and enhance our school climates. Categories: General Posts, What Do You See Wednesday | Tags: CPTED, Don Shomette, reducing violence in schools, safety expert, School Leadership, School Resource Officer, SRO, SRO Toolbox, The Shomette Group, Threat Assessment, What do you see wednesday? | Permalink. Today’s picture is from an elementary school and kind of a tough one. I can’t say too much or I might give it away. If you need a hint, let me know. Good luck! Categories: What Do You See Wednesday | Tags: Don Shomette, reducing violence in schools, Reshaping the enviornment, School Resource Officer, school security, SRO Toolbox, The Shomette Group, What do you see wednesday? | Permalink. Let’s review and discuss the last, “What Do You See Wednesday from 29 Jan 2014. Bettye Myers MS SRO (@BMMSSRO): If the only people allowed in the room during the allotted time, there is reduced supervision or fear that teens may be caught doing something they should not. Also an adult could enter and take advantage of a teen inside. Thanks for the comment, Bettye! You’re right on. I’ve been dying to talk about this one. I’m going to first address the safety concerns and then briefly comment on the ‘non-safety’ aspects. First of all, there is nothing good in this practice—nothing. But why is it bad for safety? When looking for a library book, a person can’t help but see, smell, hear, and feel (intuition) what’s happening around them. In reducing violence and unwanted behaviors, we utilize this simple (and free!) principle to help make a place safer. That’s part of what I do. I train police officers and school folks how to ‘tweak’ the environment to make kids safer. It just makes great sense. If people are going to use the space anyway, why don’t we make it easier for them to spot danger and therefore by default add them to our safety team? By doing this, now instead of a few people watching for danger we’ve made it possible for many to see, smell, hear, and feel potential danger. The library has done just the opposite. By isolating the teens, they’ve made it impossible for adults who are using the library to help out. It would be like having 25 cameras (if that’s the number of adults who browse through the area during the teen time) and instead of using the cameras to watch for danger, you shut them all off. Of course, that’s a bad analogy. Shutting out the adults is far worse than shutting off cameras because people are so much better than cameras. There is no equal to a person–they are the greatest safety device. You might be thinking that I’m advocating using adults to spy on the teens. Not at all. Just the opposite. As adults we have an obligation to protect young people. We don’t spy on teens, we protect teens and sometimes that means shielding them from adults as well as from each other. But we can’t do that if we’re not allowed to be around them. If a person feels that they have ownership in their environment they are more likely to care about it and therefore protect it. The same goes for our schools, ball fields, rec centers, and other public buildings. 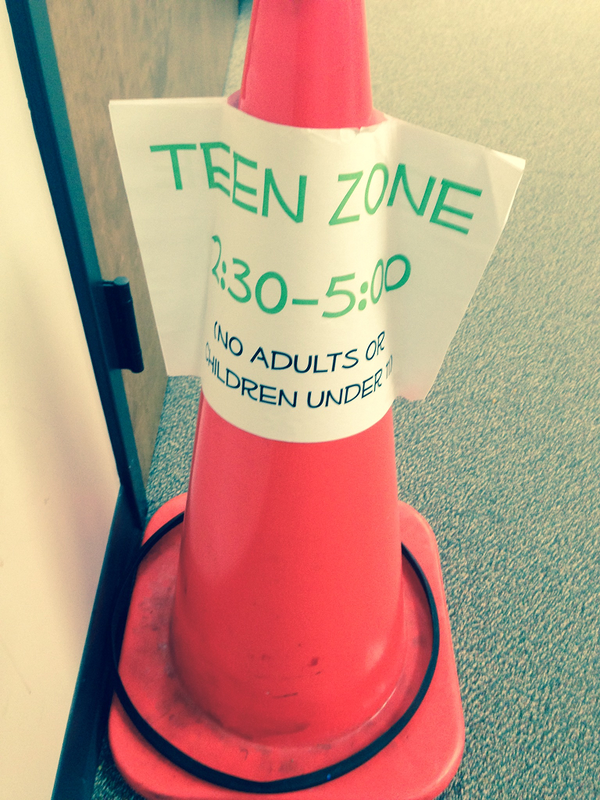 A teen zone drastically reduces ownership, it send the message to adults (a huge population at the library) that this is not your space so don’t worry about it. And soon adults will do just that—not care about it. When you separate a person from a space you separate their feelings of responsibility for the space. No one cares what happens in the principal’s office because no one has any ownership in it but the principal. Whereas, the teacher’s lounge is a shared space and most teachers feel a sense of ownership. They may decorate it with flowers, clean it, and even meet there to celebrate special events. It matters to them because it belongs to them—all of them. Any other approach is absolutely terrible for safety. It is a mistake to create a place where adults are not permitted to be with teens—regardless of the period of time—long or short. It sends a terrible message and does nothing to enhance adult-teen relationships, which are in the best interest of the teens. Show me a teen who is healthy but has little adult contact, and I’ll show you an exception and certainly not the rule. We must resist the notion that the teen years automatically equate into difficult times or comes with an entitlement to be difficult, isolated, or to receive special privileges. The more we push our teens away or believe that separation from adults is what they need or is a necessary part of being a teen, the harder and not the easier we make their lives. Categories: General Posts, What Do You See Wednesday | Tags: Don Shomette, Leadership, Reshaping the enviornment, School based crime prevention, School Leadership, school safety, school security, SRO, SRO Toolbox, What do you see wednesday? | Permalink.